The Waterford Fair is held the first weekend in October every year. It's a beautiful event full of pumpkins, dried flowers, juried art and the finest handcrafts. Aldo and I go every year, rain or shine, even though (and maybe because) it's always the same as the previous year. Every year the stand serving farm-grown lamb sausage steaming on sticks can be found between the general store and the old red barn chocked full of local art. Always immediately across the way is the blacksmith shop, where the same gentleman gives forge demonstrations and creates beautiful iron lamps and behind the red barn are several tiny pastures full of sheep and chickens and pigs. Down the street, is the dried flower barn and up on the hill, is the artist who paints enormous yellow apples and pears, and on the edge of town is the Mill where we always buy our Christmas decorations. The Fair is always the same, but there's no other fair like it; it is unique to Waterford, which is a unique Place built by Quakers in the late 1700s and still retaining much of its historical charm and character. Started over 60 years ago to raise money for the town which was falling into disrepair, the Fair has been wildly successful. It draws tens of thousands every year and raises enough money to preserve and maintain the old mill, the school, the churches, and the barns. When one of the old farms adjacent to the town threatened to be developed, the Fair brought in enough money to buy the land so the viewshed of the town would be protected and the sense of place preserved. I think the Fair draws city dwellers and suburbanites by the thousands because it reminds us all of something really important we've forgotten. 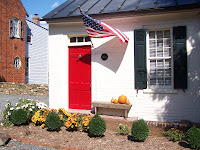 As we wander the shady streets, admire the charming cottages, sit on a stonewall to eat a warm bowl of stew, we are immersed in Waterford, Virginia, and the meaningful sense of place there. It's a feeling that brings people back again and again.